Our first leopard sighting was a slow-motion waiting game, watching the creature sleep on a tree branch. We eventually gave that one up, but in the interim, learned plenty from our guide. 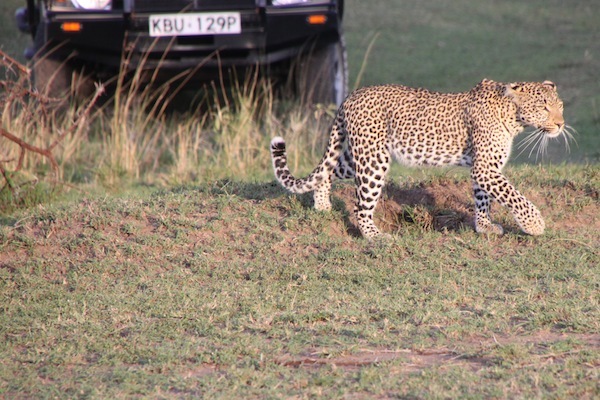 This is Fig, the leopard, skirting the vehicles in her path as she makes her way across a bit of the Maasai Mara. For one thing, the big cats don’t purr. I wasn’t going to pet them anyway! Also, our Great Plains guide Duncan discussed the Big Five, meaning the origins of the concept. Generally, these days, it is popular for tourists to put the so-called Big Five on their must-see lists, but they were originally the favorite Big Five targets of hunters: the lions and leopards for their skins; rhinos for their horns; elephants for their tusks, and buffaloes because they are just plain dangerous. 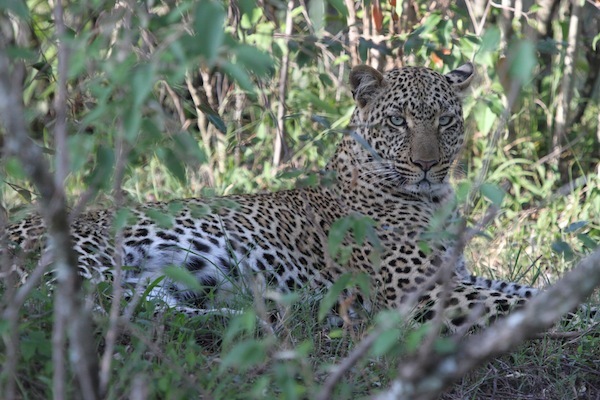 The next day, however, we — with occupants of a lot of other vehicles — watched a leopard that had been spotted at the bottom of a ravine. She climbed out of the ravine and sat impassively for a while (oblivious to or used to a lot of vehicles), even as more and more four-wheel-drives arrived and some of us moved to better positions. 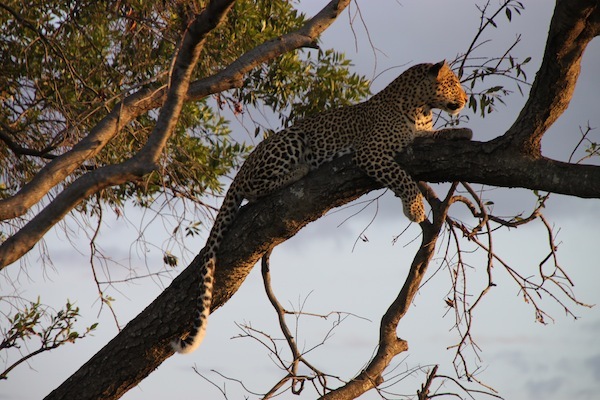 Then the leopard (her name was Fig) strolled among the vehicles, even under one, then moved onto a tree and settled high up on one of its branches. We all had great photo ops and left happy!! Fig, the leopard, looks very contented on a tree limb, the late-day sun on her face. The third story, a day later, was more dramatic. We encountered a crying jackal, which led Duncan to wonder what predator had gotten the animal so upset. We got our answer upon finding a leopard on the ground guarding her kill (a gazelle) safely in a tree, but there was a dead jackal also on the ground. It seemed likely this was the crying jackal’s companion and that the dead one had gotten too close to the leopard and its kill. It was a sad story for the surviving jackal. This leopard guards her kill, stashed safely high in a tree. She also was almost certainly responsible for the death of a jackal lying nearby. At times, watching some of the world’s grandest creatures in the wild is a double-edged sword. 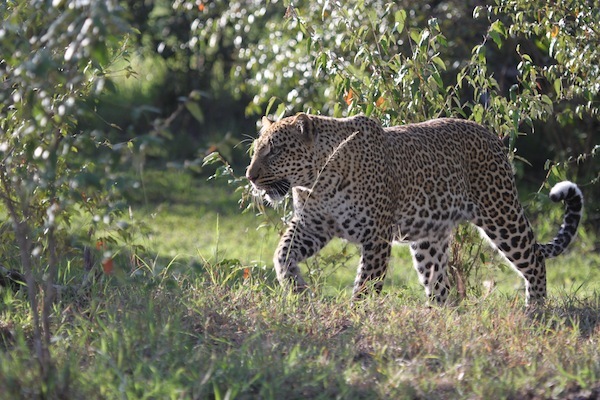 Although staying close to her kill, now on a tree limb, this leopard strolls briefly into the sun.